Lua-Pac-Man v0.1 beta is now at an open release state. This release adds the requested (Thanks to: mr_nick666) skin mod menu. The Skin mod menu makes changing sprites easy just make a folder with your mods name and add some images also skin mods change everything from the intro loop, intermissions, and of course the game. I have added four skin mods to show how easy it is. There is also a test in this release of the next mod menu item, Gametype mods. Gametype mods change how a game is played. One Gametype mod is in this release Space Invader. This simple game shows the idea but still has a long way to go. The ghost AI received a simple update. 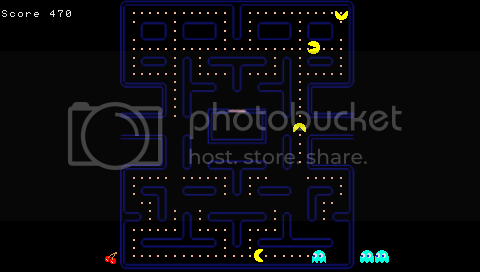 This update will help the ghosts find Pac-Man and if eaten get back much faster.